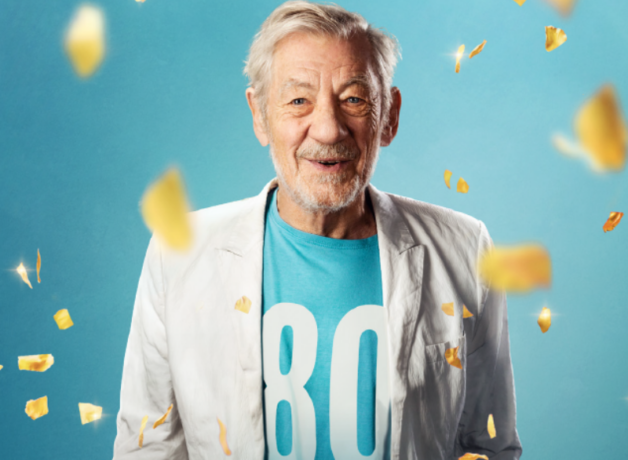 To celebrate his 80th birthday, Sir Ian McKellen is performing a brand-new show to raise funds for HOME. As a charity we must raise over £650,000 per year just to keep the doors open. Below, Ian McKellen explains how this very special event can help towards this and why he is excited to be returning to Manchester. I did my earliest theatre-going in Manchester, starting with Peter Pan at the Palace Theatre, where I much later performed an earlier solo show “Acting Shakespeare”. The new show at HOME will again include Shakespeare (and others) and no doubt memories of the old Library Theatre which I visited often in my youth. All profits will benefit HOME’s work with local communities through initiatives such as the Inspire £1 ticket scheme and will provide subsidised tickets to people who wouldn’t otherwise be able to visit HOME. See you there, I hope! To maximise fundraising and allow us to gift aid any donation portion, we have separated the donation and ticket value elements. A minimum payment of the ticket value quoted for each item secures the ticket and you may purchase these separately without making any further donation. The balance of your payment is a suggested donation. To discuss opting out of the suggested donation or making a donation of a different amount please contact the development office on 0161 212 3435. The money raised from the ticket prices for this production will provide subsidised tickets to people who wouldn’t otherwise be able to visit HOME, and help us to continue our world-class programming. The HOME charity number is 514719. Tickets will only be available for collection on the day of performance. This is to prevent resales on third party websites. After the show, join Sir Ian himself for a private drinks reception in our intimate event space, with our exclusive Gold Ticket. Watch our video to see how you can get involved with our #HOMEinspires.